When deciding what kind of blinds you should purchase, you can sometimes be overwhelmed by the many different choices that you are presented with. Roman blinds have many different benefits that make them a perfect selection of blinds in almost any home. Roman blinds can create any mood or look that you desire, and they allow you to express your personal style in a variety of ways as well. Exploring the many benefits that Roman blinds can provide will make it clear why you should choose them for your home. Many people find that Roman blinds are much more attractive than many other types of blinds, especially the teardrop shaped Roman blinds. Often, draperies or curtains can be eliminated entirely with the use of roman blinds instead. This not only saves you money but gives your home a neater, less cluttered look as well. Instead of valances, panels, and scarves, you need only a roman blind in a fabric of your choice. These blinds can be made out of virtually any type of material, and if you can't find exactly what you are looking for in the store, roman blinds can be custom ordered to meet your needs. With an endless choice of colour, pattern, and textures, roman blinds are much easier to match to the interior of your home. The simplicity that Roman blinds offer adds attractiveness to any room of your house. Since Roman blinds lay flat against the window when extended fully and do not have slats to look through, they can help increase the privacy that your home receives. Venetian and vertical blinds both have slots or spaces in between the individual blinds that they are made of, and have the potential of letting others see into your home. With roman blinds, once they are fully extended there are no areas where others can peer around them from the outside, thus providing you with secure window coverings. Light control is easily managed with the ability to raise the roman blinds to various heights. 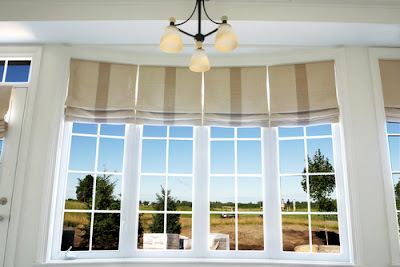 For more turn on the Roman blinds can be raised to the top of the window, and for less they can be let down completely. When they are fully extended down the length of the window, few other types of blinds are better at blocking out light. In warm weather months, you can keep your home cooler during the day by using a heavier dark coloured roman blind that will maintain the heat of the sun from getting in. The strength of Roman blinds is much greater than other types of blinds as well. 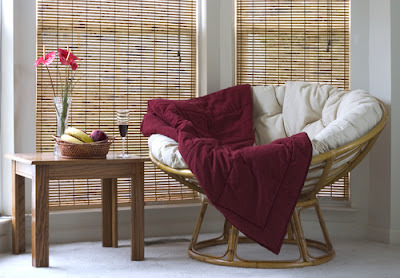 Where other forms of blinds such as Venetian or wooden have individual slats that can be grabbed, twisted, or bent, roman blinds are one single piece that is harder to damage. Young children and pets often jump up or grab blinds, often causing damage to them and causing them to have to be replaced. Roman blinds help to eliminate that problem, as they are harder to destroy. If the roman blinds that you choose are made of a washable fabric, they will last much longer too. Washable fabrics can have stains removed and are simple to clean, whereas wooden blinds require a lot of care, and vertical and Venetian blinds must have each slat washed separately. You will find that Roman blinds are also easy to use. Most of them have a simple cord that can be pulled to set the blinds to the desired height of the window. Custom made Roman blinds can often be configured to work efficiently with a remote, making them adjustable from anywhere in the room. Roman blinds are perfect for remotes, as they can go up and down in one single movement since they are not made from many tiny slats. When looking at all of the benefits that Roman blinds have to offer, the reasons why you should choose to use them in your home or office is apparent. With the versatility of design that they offer, the money they can save you by cooling your home and eliminating the need for other window treatments, and the privacy they provide, roman blinds are the perfect choice for almost any home. 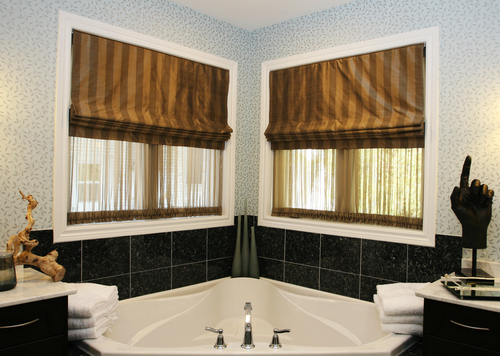 By purchasing the custom made roman shades you can add a light fabric window treatment to your home, without the use of heavy draperies or messy curtains. Just like other window treatments they can be bought to match the style in your home, or to make a statement in a neutrally decorated room. All roman blinds are flat panels of fabric when they are extended all the way down. When they are drawn up, however, there are two primary and distinctly different shapes of Roman blinds. One type of roman shade folds up into a straight horizontal line that does not bulge or hang down in any way. A teardrop roman blind shape does not lay flat when it is pulled up; instead, it forms a looped or teardrop shape with its fabric. This way of roman blind can provide a softer look, and is more delicate looking that a straight panel roman blind. You may wish to use this style with more wispy and flimsy fabric materials. The color combinations that you can choose for Roman blinds are endless. Since these blinds are made from fabric, you are free to match, contrast, or accentuate any color scheme in your home. If you can't locate a color that you like in a Roman blind at a retail store, then it is simple to place a custom order and have the exact color that you want to be made. In a way, Roman blinds can be thought of as curtains and should be treated as such when choosing a color that best suits your needs. You can use a soft wispy color for spring or summer, and a dark maroon or fall stripes pattern in colder months. If you order custom made roman blinds, you can even have your favourite color or a swatch of fabric matched, to provide an ideal look for your home. Whatever your choice, the color of your roman blinds can make a statement about who you are and what you like. As with color, the texture possibilities are endless with roman blinds as well. Fabrics are made in a variety of textures from course stiff denim, canvas, and leather to soft and subtle sheers and satins. You can create any style you desire by changing texture themes in your roman blinds. Wispier fabrics work well with teardrop shape roman blinds to provide an air of summer all year long. While dark leather with a standard horizontal roman shade shape can provide sleek sophistication in any room. You can change the texture of your roman blinds so that it varies from room to room, producing a variety of looks and feels, or go with a normal surface to match the overall interior of your home. There are some times when Roman blinds simply are not appropriate. Roman blinds can be adjusted to color and texture to match almost any interior design, but there are certain times when a different type of blind may work better for you. 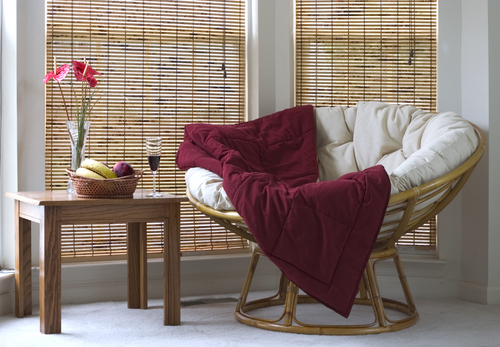 For instance, in a more rustic home setting a wooden Venetian blind may serve you better than a patterned roman shade. Another limitation of Roman blinds is that they do not serve well to cover vast windows or glass doors. For these cases, a simple vinyl or aluminium vertical blind would help better than an elaborate Roman blind. Although Roman blinds do have their limitations, they work well in almost any situation. Roman blinds are versatile and provide various ways in which to decorate your home. The addition of simple patterned roman blinds can add a chic appearance while heavy decadently patterned ones can give your home an air of indulgence. Light fabric can make it feel like summer when it is freezing outside, and warm colors can get you feel cozy all year long. No matter what your interior window needs are, they can almost always be met with the use of beautiful roman blinds.